Extinction of species is happening at an accelerated rate. More than 90% of the threatened species are due to climate change, habitat loss, hunting, and the introduction of exotic species. June 26, 2015–Scientific studies indicate Planet Earth was formed some 4.6 billion years ago. Most of us have difficulty comprehending that length of time. For some time after our planet was created there was no life in existence as we know it today. Primitive life developed 3 ½ to 4 billion years ago because of ideal conditions. Once life appeared, the number of species generally increased. At the same time the overall number was increasing, individual species disappeared (became extinct). Thus extinction is a natural process that has been taking place over time. When a majority of existing species disappear in a relatively short time it, is referred to as mass extinction. A mass extinction is defined by a loss of a least 75% of existing species within a relatively short period of time–as measured by geologic time. As human population accelerates, so does extinction of species. Climate change was responsible for the first mass extinction. It occurred when oxygen replaced carbon dioxide as the primary gas in the atmosphere. Organisms that had developed in a carbon rich atmosphere had to adapt to the change or die. Most organisms succumbed to the change. It took place approximately 1.5 billion years ago. A number of other such extremes took place over geologic time. The last was about 65 million years ago, known as the K-T boundary. It was thought to have been caused by the impact of a large object from space, which lead to the demise of the dinosaur. There have been several periods of extinction in recent times. One was at the end of the Pleistocene glaciation, when many large animals disappeared in a relatively short time. There is some debate as to whether it was due to the sudden environmental warming, or if human hunting was a main factor. A spurt of extinctions also occurred with the agricultural revolution 10,000 years ago. Extinctions increased even faster with the onset of the Industrial Revolution, about 200 years ago, and are accelerating today. The current high rate of species extinction is due primarily to human activity. More than 90% of the threatened species are due to climate change, habitat loss, hunting, and the introduction of exotic species. At the present time, species of plants and animals of all types are being eliminated at a rapid rate. The natural rate of species extinction prior to human intervention was one in five species per year. The actual rate of species extinction now is not known for certain. Scientific estimates range from 100 to 1000 times the rate prior to the agricultural revolution. In actual numbers determined by statistical theory, there may be an annual loss of species of at least 100,000 species each year. The large number of extinctions includes amphibians, arthropods, birds, mammals, and reptiles. Thousands of species probably became extinct even before they were described. This modern extinction is known as the Sixth Mass Extinction or the Holocene Extinction. The Holocene is defined as that period of known history that goes back to the beginning of agriculture some 10,000 years ago. Many species of life are accelerating towards extinction–except human. No one actually knows how many species are in danger of becoming extinct in the future. Plants and animals of all types are in danger of being eliminated. It is estimated that approximately 2/3 of all plants evaluated are in danger of extinction. For species of animals evaluated by the IUCN, the highest rate of endangered species appears among amphibians and invertebrates with a projected loss near 30%. 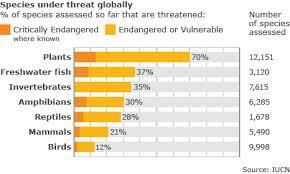 Among fish, mammals, and reptiles about 20% are endangered. Global warming and climate change contribute to the loss of many of the species already extinct and those that are in danger. The warming of the planet endangers plants and animals on land and in the sea. Two examples serve as illustrations. Cloud forests exist in mountain regions in many parts of the world. These are forests that exist high enough in the mountains so as to be immersed in clouds much of the time. In some areas they are being restricted to higher and higher elevations or are disappearing altogether. One such cloud forest is the Monteverde Forest in Costa Rica. In the world ocean many coral reefs are in danger, as species associated with reefs are dying due to warmer water. The end result is coral bleaching, the dying of the many species of organisms that lived there in the past. The Great Barrier Reef off the coast of Australia is an example of a reef which is undergoing bleaching. Forecasts are based on current as well as past data and projected into the future. There are forecasts which provide an idea of the extent of the problem of the disappearing species. Based on the use of different data and different forecasting methods, the results differ. There are forecasts that thirty to fifty percent of all of species known to exist during historic times may be permanently lost to extinction by 2050. More conservative forecasts suggest that a loss of half the spices will not take place before the year 2100. It needs to be stated that the current crisis of life on Earth does not yet qualify as a mass extinction. However, at the rate extinctions are occurring, it could classify as mass extinction within a century or two. What is clear is that the rate of extinction is increasing and will continue to increase unless action is taken soon. As a major contributor to extinction, reducing the rate of climate change is essential to saving Earth’s biodiversity. It must be done now! Categories: Climate Change, Climate Change and Diseases, Global warming and its effects on animal population, Population | Permalink.